This flex sensor is a variable resistor like no other. 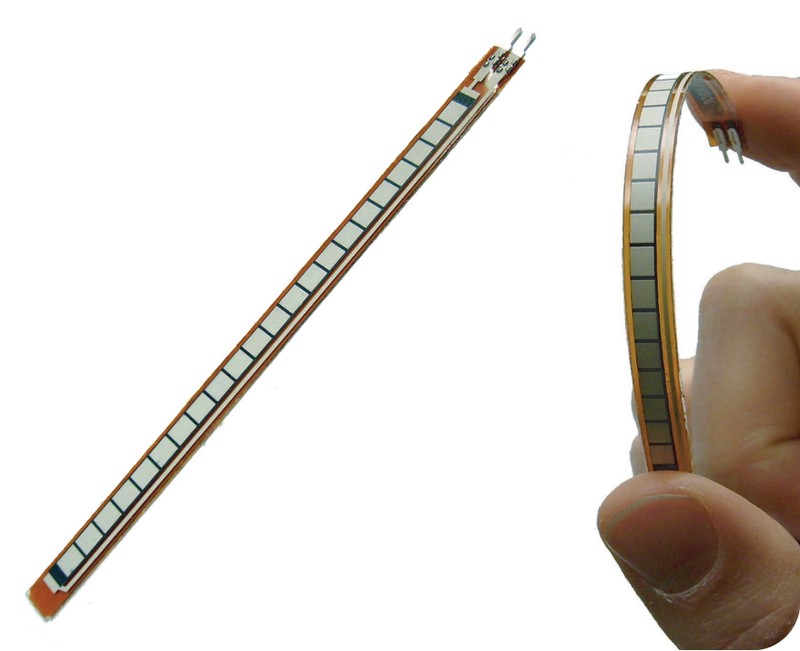 The resistance of the flex sensor increases as the body of the component bends. Sensors like these were used in the Nintendo Power Glove. They can also be used as door sensors, robot whisker sensors, or a primary component in creating sentient stuffed animals. 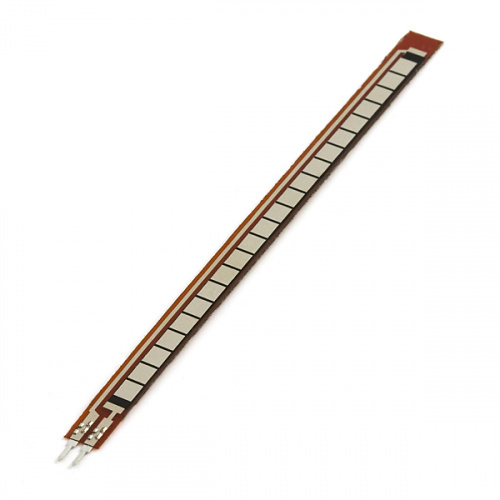 Flex sensors are available in two sizes: one 2.2" (5.588cm) long and another coming in at 4.5" (11.43cm) long. Left flat, these sensors will look like a 30kΩ resistor. 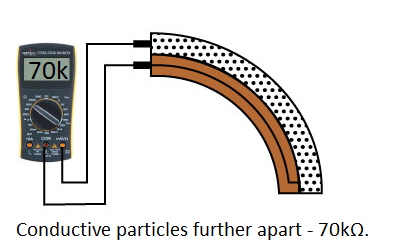 As it bends, the resistance between the two terminals will increase to as much as 70kΩ at a 90° angle. By combining the flex sensor with a static resistor to create a voltage divider, you can produce a variable voltage that can be read by a microcontroller's analog-to-digital converter. 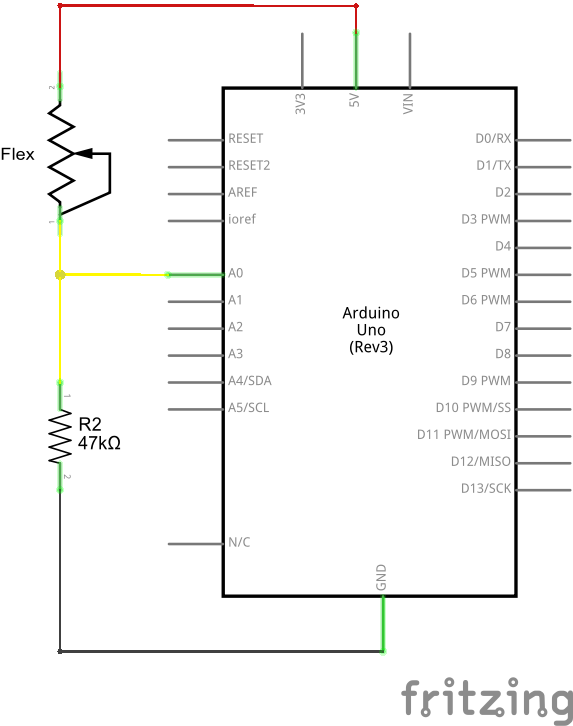 Arduino Uno -- We'll be using the Arduino's analog-to-digital converter to read in the variable resistance of the sensor. Any Arduino-compatible development platform -- be it a RedBoard, Pro or Pro Mini -- can substitute. Resistor Kit -- To turn the flex sensor's variable resistance into a readable voltage, we'll combine it with a static resistor to create a voltage divider. This resistor kit is handy for some trial-and-error testing to hone in on the most sensitive circuit possible. Breadboard and Jumper Wires -- The flex sensor's terminals are breadboard-compatible. We'll stick that and the resistor, then use the jumper wires to connect from breadboard to Arduino. Analog components, like these flex sensor's, are a great sensor-reading entry-point for beginners, but there are a few electronics concepts you should be familiar with. If any of these tutorial titles sound foreign to you, consider skimming through that content first. Before we get to circuit-building and Arduino-programming, here's a quick rundown of the flex sensor's important electrical characteristics. The flex sensor is designed to be flexed in just one direction – away from the ink – as demonstrated in the image below. 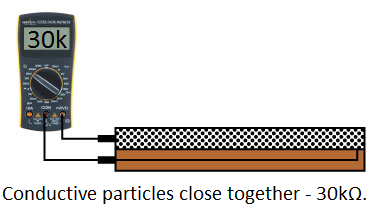 Flex sensor bend direction (from SpectraSymbol Datasheet). Bending the sensor in the other direction will not produce any reliable data, and may damage the sensor. Also take care not to bend the sensor close to the base, as they have a tendency to kink and fail. The simplest way to incorporate this sensor into your project is by using it in a voltage divider. This circuit requires one resistor. Many values from 10KΩ to 100KΩ will work. If you have a resistor kit, you may want to introduce some trial-and-error to hone in on that perfect static resistance. The 47kΩ resistor on the ground side, and the flex sensor on the 5V side, means as the flex sensor's resistance increases (meaning the sensor is bending) the voltage on A0 will decrease. Create a voltage divider circuit combining a flex sensor with a 47k resistor. // accurately calculate bend degree. If the value's don't seem correct, make sure the constants VCC and, more importantly, R_DIV are accurate. If you used something other than a 47kΩ resistor, enter that value in for R_DIV. 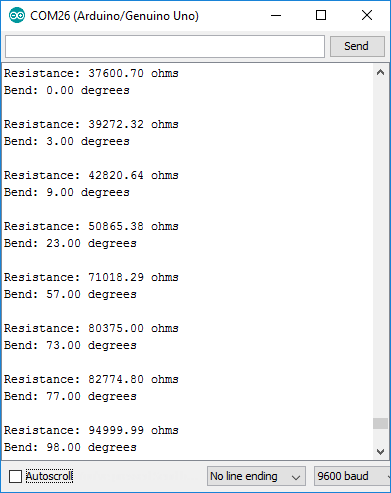 Through trial-and-error, try to hone in on more accurate values for STRAIGHT_RESISTANCE and BEND_RESISTANCE -- your flex sensor's resistance when it's straight and bent at 90°. 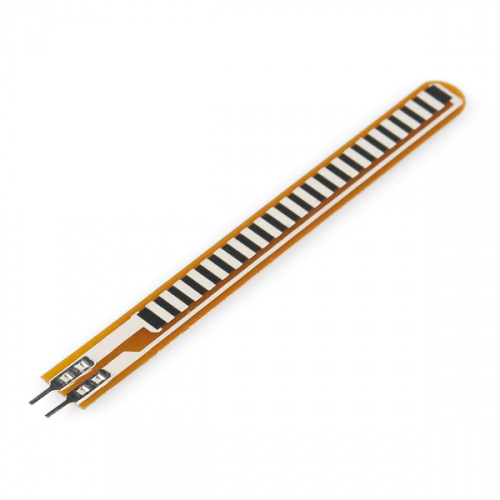 Looking to add the flex sensor to an e-textiles/wearable project? Try using the Qwiic flex glove controller that includes the 4.5" flex sensor.